Breast cancer cells can be deadly if they spread through the body. Limiting asparagine could stop the spread, a new study finds. An amino acid commonly found in food is essential for breast cancer to spread, and restricting it stopped it from spreading in mice, according to a new study published in the journal Nature. If research confirms the finding in humans, limiting the amount of asparagine that cancer patients eat could augment existing therapies in preventing the deadly spread of breast cancer to other parts of the body, researchers said. The study “adds to a growing body of evidence that suggests diet can influence the course of the disease,” one of the study’s first authors, Simon Knott, associate director of the Center for Bioinformatics and Functional Genomics at Cedars-Sinai Medical Center in Los Angeles, said in a statement. Most breast cancer patients don’t die from their primary tumor, but from its invading other parts of the body. Researchers found that, in mice, blocking the production of asparagine with a drug and feeding them a low-asparagine diet greatly reduced the breast cancer’s ability to spread, Cancer Research UK, which was one of the funders of the study, said in a statement. 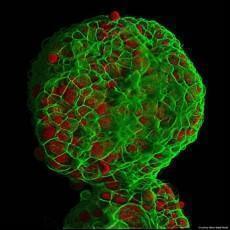 “Our work has pinpointed one of the key mechanisms that promotes the ability of breast cancer cells to spread. When the availability of asparagine was reduced, we saw little impact on the primary tumour in the breast, but tumour cells had reduced capacity for metastases in other parts of the body,” the study’s senior author, Gregory J. Hannon, director of the Cancer Research UK Institute at Cambridge University in England, said in a statement. Foods that are rich in asparagine include dairy, whey, beef, poultry, eggs, fish, seafood, asparagus, potatoes, legumes, nuts, seeds, soy and whole grains. Most fruits and vegetables are low in asparagine, researchers said.